Battlefields: The Final 48 Hours! Devastating Stretch Goals: Ogre Battlefields! Ogre Playmats, Including International Shipping! Ogre Miniatures Update and a New Plastic Pocket Box Game? The Ogre project continues to move toward its final two releases. What a trip it’s been! Ogre at Origins, Mark VI Coming to Kickstarter, and More! Ogre Miniatures, Second Edition - LIVE! Join us every Friday for Ogre Video Game multiplayer! 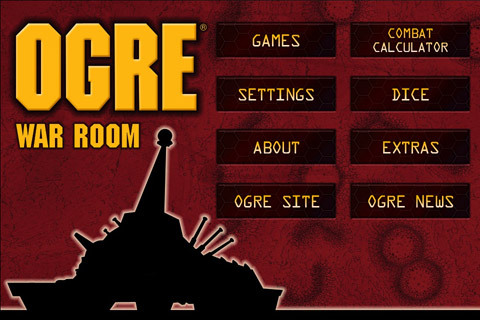 Ogre Video Game Now Available on Mac! Ogre Miniatures Set 2 Goal Achieved! Ogre Miniatures Set 2 Live Now, OMS1 Armory Box Preorders Open! Ogre Video Game Now Available On Steam! The wait is over! Launch day is here and Ogre is available to play on Steam. Ogre Video Game Coming October 5! Name the Ogres, Mark II! New Ogre Miniatures Set 2 Test Shots, And Ogrezine! Ogre Tournaments At Gen Con! Some 40th Anniversary gifts from Auroch! Ogre Scenario Book 3 Delivered! Ogre Updates! Miniatures. Video Game. New PDF! To play, or not to play . . .
As Ogre’s 40th Anniversary begins to unfold, I have a few odds and ends left over from last year. Ogre Miniatures Set 1: Kickstarter Closes Soon, New Reward Level "Many Minis!" $425,000 - GOAL ACHIEVED! More Tom Smith music! We do. And we have just one word to describe our reaction: Wow! Ogre Scenario Book 2 Delivered! Ogre Miniatures Set 1 Launches On Kickstarter! Hello backers! We are proud to announce the launch of our Ogre Miniatures Set 1 on Kickstarter! The Ogre 6th Edition set will come out early in 2017, followed in a few months by an expansion set, currently titled Ogre Reinforcements. First: Those of you in the US, have a happy Fourth of July! Actually, all our backers everywhere should have a good day too. That seems only fair. New Line Editor: Welcome, Drew! It’s time and past time for another update, so even though I have no big milestones to report, here’s where we are. Though the main appeal of this release is intended to be for those who did NOT get the Designer's Edition! Here's the latest from Ogre artist extraordinaire Brandon Moore. Car Wars 6th Edition rolls on! Last But Not Least! Final Scenario In The Wild! The last update in the Ogre Designer's Edition Scenario Contest, today's entry is an explosive little Holiday surprise! It's an Assault on Amsterdam! We’re closing in on the second to last of the Ogre Designer’s Edition scenarios with an Assault on Amsterdam! We announced Ogre: Operation 218 earlier this year. Now, it’s time for an update! After the post-GenCon flooding, the Scenario Contest update didn't happen last week, but we're back and the race is on to Ogre Designer's Edition scenario #12 - Footrace! As noted in Monday's Daily Illuminator, our offices in Austin flooded. No good deed goes unpunished, as evidenced by Ogre Designer's Edition Scenario #11- Counterattack! Ogre Designer's Edition Scenario #10, Uncivil Engineers, is out in the wild! Can you spot Scenario Nine? Can you spot Ogre Designer's Edition Scenario #9? Look carefully...it's a Hidden Lab! We're Back With Scenario Eight! We are back from our summer break with Ogre Designer’s Edition Scenario #8, The Dragon of Madgeburg. Scenario Seven In The Wild! Today, Ogre Designer's Edition Scenario #7, Two Nations, One War, is in the wild! Scenario Six Has Been Spotted! Ogre Designer’s Edition scenario number five, Luck of the Draw, is now live on the website! The Battle for Sheffield is ON! The Battle for Sheffield, the fourth scenario for Ogre Designer’s Edition is ready, and it’s a slugfest to capture an Ogre production facility. Now You Can Play The THIRD Ogre Scenario! A Second Ogre Scenario Into The Wild! In Update #186, we announced the release of the first new scenario for Ogre Designer’s Edition and today, we’re releasing scenario number two into the wild! Ogre Designer's Edition Scenario Contest! "My personal goal is to launch the survey before May 1, 2015." Two new pieces of fabulous news to share with all of you today. Car Wars Classic Returns . . . Then Vanishes. We want to keep the Steve Jackson Games Kickstarter community informed about the latest from the land of Car Wars, because there's a lot going on! Nightfall Sponsored Sheets In The Wild and Pocket G.E.V.? As a quick reminder, our last update announced Ogre Designer’s Edition Nightfall counter sheets would ship from our warehouse. Welcome to 2015 and the first Ogre Designer's Edition update of the year! More ACD Sheets Are Here! We’re releasing more ACD sheets for Ogre Designer's Edition into the wild at 2 p.m. Central Standard Time TODAY, Nov. 12!!! ACD Sheets Are Coming Back! Car Wars Classic Now Available! ...But not for long. The Car Wars Classic boxed set finally arrived at our warehouse, and is now available at Warehouse 23! Hurry, because supplies are limited. We have news on the status of four of the sponsored counter sheets. Warehouse 23 Badges and Ogre Boxes. Coming Next Week! Sponsored Counter Sheets, Ogre Designer’s Edition Again, and More! Folks who have been following the updates here know there has been some movement around the office. If, that is, you can come to Dallas. I (finally) got my 2013 Report to the Stakeholders finished and posted. An Ogre Built Out of LEGO! German OGRE Rules Now Available! Ogre Pocket Edition Now Shipping! Mini Car Wars Available Now! Ogre Miniatures: Available Now, Pre-Order Next Week, And . . . Shapeways? Any of you in the DFW area? I'll be at the T.A.B.L.E. show this weekend. Details here. Check out the entire guest list. Pretty classy! This Saturday I will be at Owlcon at Rice University in Houston, so if you are a Houston-area backer, come say hi! With the Ogre Designer's Edition Kickstarter copies shipped, and retail copies flying off shelves, we're proud to announce the Ogre Fan Scenario Contest! Wave Two Ogre Extras Available! Mini Car Wars, Car Wars Classics, And More Bundles! BoardGameGeek Exclusive Counter Sheets Available Now! I just made this announcement from our booth at BGG. Now I'm telling the rest of the world. Over 2,000 Ogres in the Wild! When you go home today, you might want to be on the lookout for Stealth Ogres. They're crafty, and every bit as dangerous as the noisier kind. Correction to the previous post: Steve's house is a total loss. He's looking for a new place to live. Comments on the last update have included some “Mine is here!” So that's a few dozen down, a few thousand to go. Was ist das? It's the draft text for the Ogre Designer's Edition rules -- in German! The contact for the Launch Party East is NOT the same as the one for the Launch Party West :/ They are geographically distinct. Extremely so. Ogre fans in New Jersey are planning another launch party on November 16, starting at noon. Join Us In The Factory! Three containers received now, and the last one went VERY smoothly. It was unloaded in one hour and 45 minutes! Kudos to the OLF team. We had 20+ new registrations by Monday afternoon, and only got about three more today, so I'm saying "it has tapered off, and everybody who wants in is in." We're delighted to announce the Wave Two reprints of Ogre Minis, now on sale at Warehouse 23. This helps fulfill our $450K stretch goal promise. Good News For Daniel . . . But . . . The good news is that Daniel and Kaitlyn are about to be the parents of twins! First Two Containers Ship This Week! China Update: Things Are Looking Incredible! China! It's Full of Ogres! Hong Kong Update: Ogre Looks Awesome! Have We Mentioned That The Box Is Big? Last Chance to Register for Launch Party! We currently have about two hundred folks coming to the paaarty in Austin on October 19! Launch Parrrty! Registration Now Open! When and where will the Launch Party be held? Final Sample Arrived This Morning! Over Twenty-Five Pounds of Awesome! Ogre Garage Open For Business! Thanks for your patience! We've received penultimate tray samples, which are a beautiful fit. We posted the almost-final version of the Ogre Designer's Edition rules and scenarios, for your feedback, back in October. We’re pleased to report good progress on the trays. Richard painstakingly laser cut each layer of the Masonite trays below, to Sam’s exact specifications. Ogre Garage – Yay! Arrrgh! Cars Wars Fans, It's Time to Vote! Car Wars Forums Are Go! One popular request for the storage trays is space for extra counters, from the $4.5K backer level sponsor sheets. Car Wars -- On Your Marks . . .
Another casualty of our Ogre delays was missing out on launching our special Car Wars forum before the start of 2013. • The maps, counters, dice and play references (rulebook, scenario book and reference sheet) were sent to print in November. We’re back at work, the Ogre is grinding steadily forward, and on Monday, Daniel Jew will be here in the office as Ogre Line Editor! And here's the Scenarios book PDF. Comment on our site or on BGG. Not This Year . . . I'll be at SPIEL 2012 in Essen next week, with some prototype Ogre Designer's Edition 2-D and 3-D counters (including Ogres! ), and reduced-sized map samples. The Ogre Box Is Not Too Big To Lose! Hi everyone, I'm Daniel, the new Ogre Line Editor (read: dogsbody, aide-de-camp, and general lackey for all things Ogre). Many of the SJ Games crew will be at GenCon, and they'll have a lot of prototype material with them, so if you're at the show, check it out! Ogre Box Names Roll Call #2! Last Chance for Review! Ogre Supporter Box Names - Roll Call! My, there's a lot to do yet. But the Ogre grinds on. Look At All The Ogres! The Big Survey Is Out! Kickstarter Exclusive Sheet 3 Surrrrrvey! I am looking forward to a quiet Memorial Day weekend WORKING ON OGRE. We are now accepting applications for the job of Ogre Line Editor. Our threat goal is fulfilled. 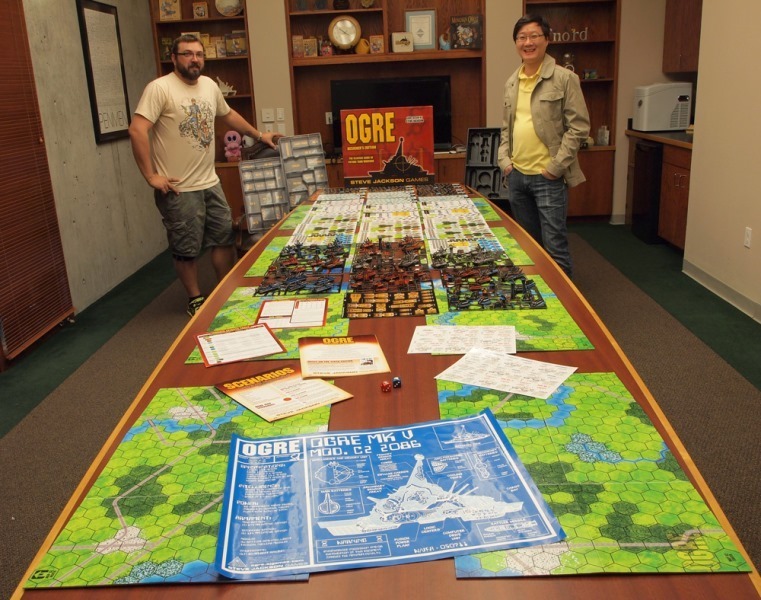 Here'a a shot of some happy game geeks and their Ogre. Note repeated crit-fails on High 5. Technical issues taken care of! Learn how to play while the clock counts down, but don't forget to have everything set first! Home now. Hamburger cooking.Tomorrow starts early. Today needs to end soon. What is this now, a blog? FINALLY! International Shirts and Stuff! We were on “That’s How We Roll” last week, and we’re not sure we pointed to it! So there it is. 68 Hours To Go; Red And Blue Dice! We’re hanging in there. Phil just Skyped from China to show us dice. Well, it’s night rather than morning, but here it is. You can see the a PDF of the current draft of the rules and scenario book here. This is an announcement I was sure I would never make. And some of you are going to think it’s booooooring, and some of you will dance. Walkthrough, More Counters, More Goals! Andrew Walters, who has been playing and playtesting Ogre and G.E.V. for a very long time, has done some excellent walkthroughs for Ogre. See them here! We have now reached $250,000 and another “ship earlier” stretch goal. Time to unlock $300,000 . . . but there are several options. We are on track to pass $200,000 before the end of the day. (Edit: it happened about 6:30pm, Texas time). (1) There’s a short video of Steve reacting to the first couple of hours of support.